I got to finish reading two books in a week’s time–definitely a rarity for me since my venture into parenthood–while in Colorado just last week. 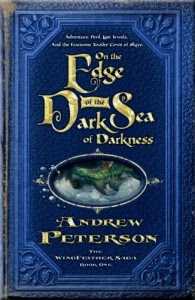 The second book was the first installment of The Wingfeather Saga by Andrew Peterson: On the Edge of the Dark Sea of Darkness. Peterson is one of my favorite singer/songwriters, and I was excited to get the first two books of The Wingfeather Saga for Christmas. This really is a great read, especially if you like adventure or fantasy books. Some story lines certainly are extended parables and have spiritual overtones, but like a good C.S. Lewis or Tolkein novel (though not on the same level), the spiritual overtones add to the experience, rather than distract from it. In short, it’s a great page turner with fun characters. In addition, I love Peterson’s dry sense of humor, and as I read I can picture him telling the story to his own children. I’m not sure how long the series will be (I couldn’t find any info online; if anyone has any info, please let me know), so I’ll withhold all my praise on the whole series until I get a chance to see how the plot and characters unfold. But this first volume in The Wingfeather Saga was a lot more fun than I’ve had reading a book in a long time, so I highly recommend it. I’m not sure what reading level it is, but it would definitely be a great novel for younger readers as well. Peterson is a great storyteller in his songs, and his writing is no different. Thanks, Jon. Is there a date for book #3? All I can find is sometime in 2011. I heard the same – 5 books, next one out in mid to late April. In my house the first two books were read by a 9 year old boy, a 12 year old boy, and a 37 year old female (I'm not telling which one is me!). We all LOVED the books and are super-anxiously awaiting the next one. If you follow Andrew on twitter or facebook, he's been posting lines from the new book, which is a wonderful tease. My (now) 10 year old had Andrew sign our beaten-up copy of the first book a couple of months ago and Andrew wrote "the stories are true!". We loved it.